Please note: This piece contains spoilers for the second season of The Good Place. Read at your own risk! The Good Place just finished its second wonderful season, and while the entertainment void it leaves behind as it goes on hiatus is not as boundless as the void Janet lives in, the absence is still felt. Deeply, in my case. I recently finished re-watching all of season two to help assuage some of my feelings of loss. 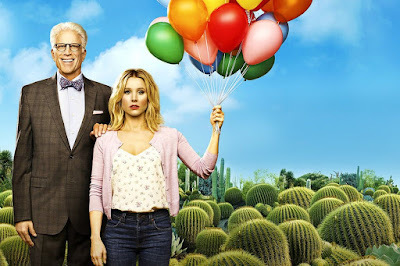 It just made me want the third season even more, but during my re-watch I noticed something: This show is even better when it’s binged, because binge-watching makes the incredible character development and storytelling of The Good Place even more obvious. Also, it possibly uses philosophical theories to win at TV. Chidi name-drops Nietzsche's eternal recurrence theory in the second episode of season two, associating that idea of living through an infinite loop of finite events with the torture he and the other humans have endured during their stay in the Bad Place disguised as the Good Place. It’s not an inaccurate comparison (of course not because Chidi’s making it) but I did notice that, in addition to the eternal recurrence theory being true in-universe, it’s also the framework by which The Good Place functions as a show. And that framework of constant re-invention, re-visitation, and repetition might just be the reason why this show’s storytelling works so forking well. So much of television focuses on very precise, clear-cut narratives. The hero must defeat the bad guy. Next season, the hero must defeat an even bigger bad guy. Next season, and next season, and so on and so on — it’s repetitive, but in the worst way. It’s “big picture” repetitive. It’s repetitive at the very core of the story, which just makes the narrative foundation uninteresting, and that uninteresting foundation negatively affects everything built upon it. Furthermore, these kinds of stories are structured in a literally linear way. We call them “story arcs,” but they’re not really — they’re lines. Straight lines, in fact, from point A (the hero realizes the bad guy must be defeated) to point B (the hero defeats the bad guy). I mean, technically speaking the story arc diagram is a series of peaks and valleys that indicate rising and falling action, but there is a very distinctively linear path between the realization of goals and the achievement of those goals when it comes to your typical narrative, because those typical narratives have those uninteresting foundations at their cores. Not so with The Good Place. Its charm lies in its ever-looping, cyclical nature, its duplication of the eternal recurrence theory. Where other shows are straight lines, The Good Place is like a Spirograph drawing: constantly overlapping in different patterns to create a beautiful, unique whole. The more loops it makes, the stronger the design becomes, and the variations derive from the show’s focus not on the linear A-to-B success story, but on the intricacies of human behavior and the chaos that erupts from that. Even though it’s important that our favorite team of crappy humans get to the real Good Place, so much more of the story is about how they grow as people and how that growth seems to compound with each repetition. The second season, because it was no longer limited by the twist of the first season, could double-down on all that character development and make the growth of each character feel natural and believable. Michael is probably the best example of this, evolving from a careless demon set on torturing four humans and saving his own skin, to risking everything just to save the people he had grown to care about over the course of 802 resets. In other shows, this sort of character development in a literal demon would seem rushed, but The Good Place uses those 800+ recurrences of the same or similar events to explain how Michael noticed Eleanor, Chidi, Tahani, and Jason’s capacity for emotional and moral growth and takes that observation to jump-start his own moral change. It also helps that the writers set a tone for the show that’s smartly whimsical, so we never get the impression that Michael is super into the human torture stuff implied by the Bad Place’s role as a non-denominational hellscape. A perfect encapsulation of how the repetition of events and character growth patterns affects these characters lies in Janet, who gets more and more advanced every time she’s reset. Janet, over the course of the show, has probably become one of my favorite characters in TV. She could have been a one-note AI character but instead turned into a complicated, multi-dimensional person, thanks to the way the show’s eternal recurrence framework permits Janet to grow, improve, and advance. She can fall in love now! She can pretend to be bad! She can lie! Just like Michael’s transition from a monstrous demon to a caring advocate for humanity, the writers have used the passage of time implied by its constant resets to make Janet’s development feel natural within a limited number of episodes. And the same can be said for the human characters. Yes, it’s true that the humans who are reset don’t remember anything that happened previously — but how much of their understanding is affected subconsciously? Eleanor goes from half-heartedly assuming she’s in love with Chidi in the first season, to fully accepting her love and declaring out loud during one of the resets, to suffering through an unrequited love based off the knowledge of that requited reset love — all levels of growth for her character, and all thanks to the show’s ability to loop through different degrees of character development and compound upon previous iterations. 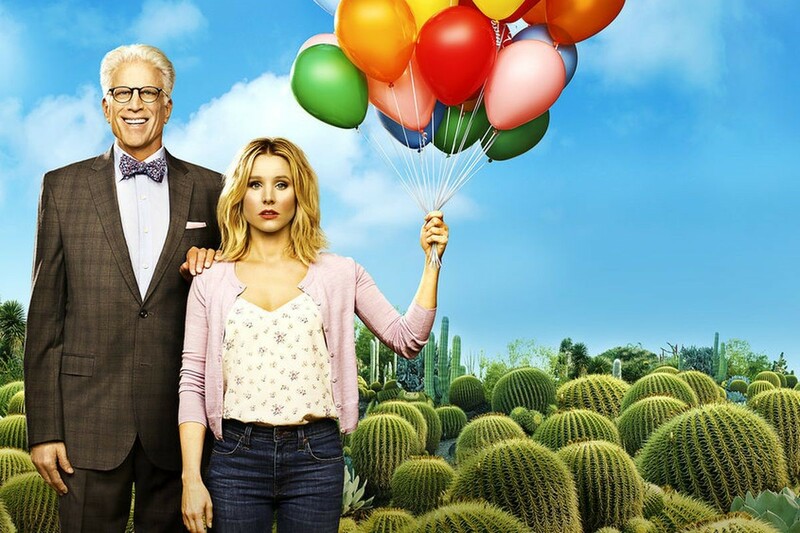 The Good Place puts all its money on its characters and the result is some truly remarkable storytelling within what could have been a limited premise. I can remember watching the first season and wondering how the show could possibly continue in the long-term with the story framework it gave itself, but it flipped that framework on its head and made way for an exciting, innovative, and narratively intriguing second season that put all the emphasis on character development as the driving force. The second season’s finale, in which we see Eleanor attempt to be a good person while she’s still alive, fail at that attempt, and try again — that’s the show in a nutshell, right there. A beautiful nutshell full of ethical nuances and all the charm of being a flailing, clueless human making an effort to do the right thing without really knowing how. Or why. But knowing deep down that we owe it to ourselves and to each other to make honest attempts at goodness, at kindness, and at making life a little better for everyone regardless. Also, considering how the show can basically take the “it was all a dream” trope — a storytelling trick that falls at the top of my list of most loathed storytelling tricks — and make me love and respect it, I have some pretty high expectations for season three. May The Good Place’s genius continue recurring eternally. Or at least for a few more wonderful, wonderful seasons.